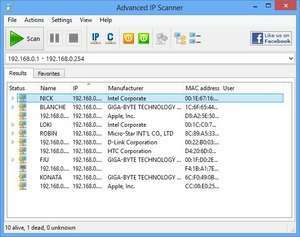 Advanced IP Scanner is a free and portable application which scans your local network for connected systems and services. The application is quite useful in finding shared files and folders as well as supporting different protocols such as HTTP, FTP, RDP and Radmin. As a portable application, installing Advanced IP Scanner is not necessary and can be run from portable devices like USB hard drives, pen drives, among others. The program can also be installed if you wish. Version 2.5.3784 is a freeware program which does not have restrictions and it's free so it doesn't cost anything. For security reasons, you should also check out the Advanced IP Scanner download at LO4D.com which includes virus and malware tests. Additional screenshots of this application download may be available, too.